Northcoast SBDC and Willow Creek Chamber of Commerce are hosting a Strategic E-marketing Workshop on Tues. April 16th at 5:30 pm sharp. This will be a virtual workshop streaming from Eureka with a SBDC representative in Willow Creek to provide materials and advice. If we get good attendance at this workshop, we hope to host other workshops based on Willow Creek business and community input. This workshop is useful for both existing, new businesses and non-profits. Learn how to use digital media resources and time wisely to reach more customers and grow your reputation. 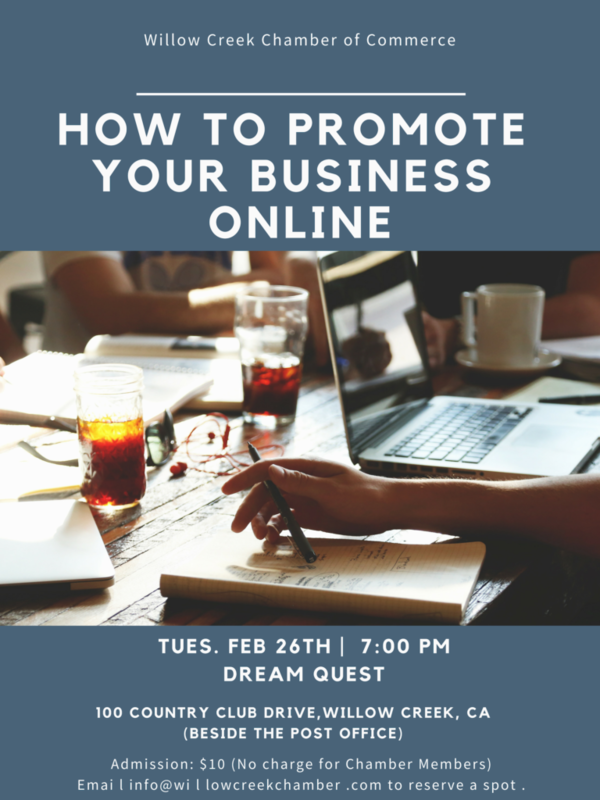 This workshop will offer a high level refresher of key marketing concepts with focus on digital marketing know-how and skills for business owners who know a little about social media. With a particular focusing on developing your persona(e) and planning strategic marketing campaigns. Opens 10 - 5 weekends in May. Open 7 days a week, from Memorial Day to Labor Day. Drop by for information. maps and area publications.